Finally! Video clips from my 2002 trip to North Korea are ready for download. The North Korea Videos page has two of my own clips, plus links to several others. Click for more on my travels in North Korea, Iraq, and Iran. Download Journey into Kimland as a single pdf. 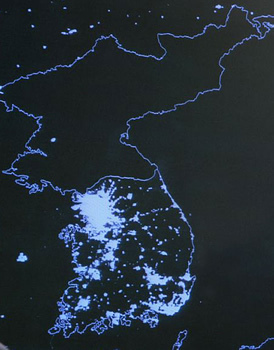 the lack of lights in the North outside of Pyongyang. Story of golfing in Pyongyang and the "greatest round ever played" - Kim Jong-il's 34 on the par-72 course in Pyongyang. Good writing and a funny story. A BBC documentary partially filmed in the North. The video is unfortunately only available for purchase on tape, not download. Listen to the download of a BBC journalist's radio story on his visit to North Korea. Also includes a slide show. For an interesting look at U.S. - North Korea relations, as well as a wealth of background info on the North, try this Frontline documentary by the U.S. PBS network. Website maintained by two Dutch expats working in Seoul. They also have an interesting, and growing, collection of life in North Korea stories written by friends working in Pyongyang. A way to visit North Korea via boat from the South - a tour of Geumgang Mountain. Long thought of as one of the most scenic areas on the peninsula, package tours are now available through tourist agencies in the South. Click here or above for info. The Citizens' Alliance for North Korean Human Rights (NKHR), founded in 1996, maintains an excellent, extremely informative website on life and human rights in North Korea. The 'Witness Accounts' section contains some utterly harrowing stories on life in, and escape from, North Korea. I highly recommend a visit to the website (part of it is in English). The group itself is, "a non-governmental, nonprofit and nonpartisan organization working to improve the human rights situation of the people in North Korea as well as of those North Koreans who have fled their country for various reasons." Know of something else I should include?